It’s a repeat for Long Beach State outside attacker TJ DeFalco winning one of the top national awards in college men’s volleyball. 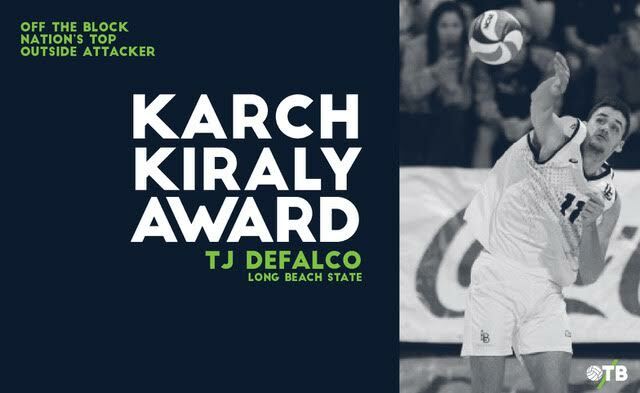 Off the Block announced Wednesday that for the second straight year a nationwide voting committee selected DeFalco as the recipient of the Karch Kiraly Award. The Karch Kiraly Award, which is named after the former UCLA All-American and U.S. Olympian, is presented to the nation’s best outside attacker in NCAA Division I-II men’s volleyball during the regular season. DeFalco was in the nation’s top 20 with both a 3.61 kills per game average and a .375 attack percentage. In addition, the 2018 Big West Player of the Year had nine regular season matches with double-digit kills while hitting at least .400. Among DeFalco’s top performances was a match-high 23 kills on a .500 attack percentage in a road victory against UCLA in February. That victory was part of Long Beach State’s program-record 23-match winning streak to open the season as the 49ers earned the No. 1 seed for the upcoming NCAA Tournament. DeFalco returned for the junior season after spending the offseason helping the United States reach the 2017 FIVB World League Finals. Along with his offensive performance this season, DeFalco was fifth in the nation with a 0.55 aces per game average and was among the Big West leaders averaging 1.84 digs per game. A voting committee of about 25 men’s volleyball coaches and volleyball media members from around the nation determined the winner of the Karch Kiraly Award. The top three vote-getters were named finalists for the award. DeFalco earned 55 votes and more than doubled the amount votes received by the runner-up Ohio State outside attacker Nicolas Szerszen. The other finalist Pepperdine outside attacker David Wieczorek finished in third place with 13 votes. This is the fourth year that Off the Block has presented the Karch Kiraly Award. Previous winners of the award include former Penn State All-American outside attacker Aaron Russell in 2015 and Szerszen in 2016. The Karch Kiraly is one of several end of season awards presented by Off the Block. Among the other national awards includes the Lloy Ball Award to the nation’s top setter, the Bryan Ivie Award to the nation’s top opposite, the Erik Shoji Award to the nation’s top libero and the Ryan Millar Award to the nation’s top middle attacker. Off the Block is a national award winning website that launched in 2011 and is the nation’s leaders in college men’s volleyball coverage.